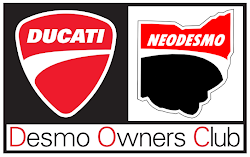 NEODESMO Ducati Owners Club Members, we had a blast with you in 2014. We saw several of you every month at Club Mangia, Ducs at the 'Bucks, and our new westside event, Desmo Dolce. Members organized several fun rides and discovered more of Ohio's beautiful roads. Our 2014 Ducs at the 'Bucks and Desmo Dolce season has come to a close, but we still have Club Mangia the second Wednesday of each month. We're in the process of planning our events for 2015 and hope you'll all fill out the Member Feedback Survey that we sent to your email. We are also working on designing new Club Gear! We're excited about having something new to offer in 2015. Most of you have picked up your Ducati Welcome Kits. Please remember to make arrangements to pick it up, pick it up at one of our events, or pay for us to ship it to you. We've just received another shipment and we're running out of storage space! Welcome to our new Members too, we've loved meeting all of you! Thanks to everyone for being patient with us this year as our personal obligations took up most of our time. Thank you to our 2014 volunteers Raj and Charlie for all of your work! If you are interested in volunteering for 2015, please let us know. In case you missed the email, please note that tonight's Desmo Dolce has been cancelled due to the weather.